Skip the drive through and make this simple Earl Grey Vanilla Tea Latte at home! 2 Earl Grey tea bags your favourite brand. I like Stash Tea. Set a medium pot over high heat and add the water. When the water begins to boil, turn the heat to low and add the tea bags. Let the tea steep until it's as dark and strong as possible (about 5-7 minutes). While you're waiting for the tea to steep slice open the vanilla bean pod and scrape the seeds out using the back of a paring knife. Set the pod and the seeds aside. Remove the tea bags from the pot and stir in the honey until it dissolves. Add the milk, the vanilla bean seeds and the whole vanilla bean pod to the pot and stir gently with a spoon until the mixture reaches a simmer. Keep the heat low to prevent the mixture from boiling and to maintain a low simmer. Let the mixture simmer for about 4-5 minutes over low heat, stirring every minute or two. Strain the mixture as you pour it into 4 mugs. Some of the vanilla bean seeds will sneak through the strainer but the strainer will catch the big chunks. 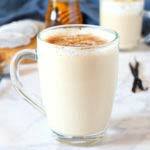 This will create a beautifully speckled appearance to the latte mixture and the addition of real vanilla bean instead of vanilla extract creates an intense vanilla flavour that's the perfect compliment to the flavour of the Earl Grey. If you can't find vanilla bean pods, feel free to add 2-3 tsp of real vanilla extract instead. The flavour won't be quite as intense, but it will still be delicious!! Add some vanilla sugar to the top (if desired) for garnish. Enjoy!